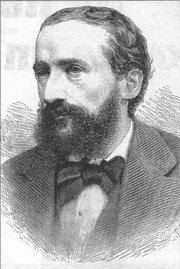 Johannes Hermann Zukertort (7 September 1842 Lublin – 20 June 1888 London) was a leading Polish-Jewish chess master. In 1861, he enrolled at the University of Breslau to study medicine, but he never qualified. However, in Breslau he met the leading chess player Adolf Anderssen and studied with him, finally defeating him in a match in 1871. In 1867 he moved to Berlin and in 1872 to London. In that year, he played Wilhelm Steinitz in London, losing 9-3. He excelled at playing while blindfolded. In 1876, he played 16 games simultaneously while blinfolded, winning 12 and losing only one. In 1878, he won the international tournament in Paris. In 1883, he won the international tournament in London, defeating nearly every leading player in the world; after this, he was widely regarded as unofficially the World Champion. Steinitz came second. From 11 January to 29 March 1886 he played what is generally regarded as the first official World Championship match against Steinitz, losing 12.5-7.5. The matches were played in the United States, in New York, St. Louis and New Orleans. After this defeat, Zukertort�s health suffered and he was a greatly weakened player for the remaining two years of his life. It is said that Steinitz and Zukertort, present at the same dinner party, both rose in response to a toast to the "greatest chess-player in the world". This article is based on the article Johannes Zukertort from the free encyclopaedia Wikipedia and stands under the GNU-Licence for free documentation. In the Wikipedia a list of the authors is available.